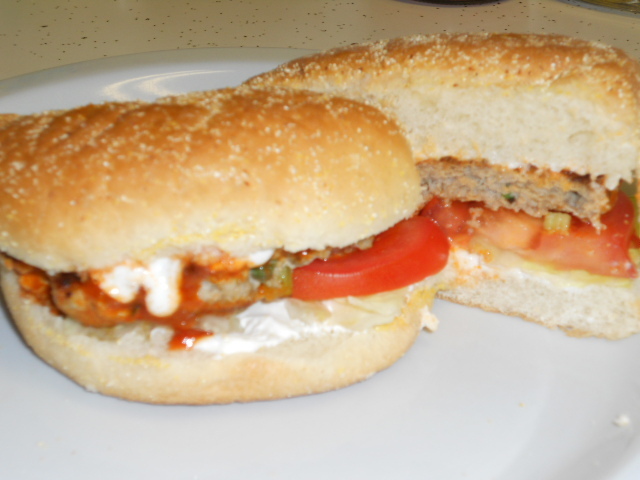 Blue cheese or ranch dressing atop a turkey buffalo burger, yes please! Mr.Picky loves spicy food, and loves burgers. I tried this recipe out a couple of years ago and have continued to put it into dinner rotation. If you have children it is ok, just don’t dip the burgers in the sauce at the end. This recipe came out of Rachel Ray 365: No Repeats cookbook. Mr.Picky prefers to eat these as little sliders on a small french roll. The burger size depends on what we have to put them on, in the picture we served full size burgers on a crusty bun. In a small bowl combine sour cream, blue cheese and salt and pepper. Set aside in fridge while making burgers. If you do not care for blue cheese, simple use ranch. Drizzle about a tablespoon of oil in a mixing bowl and burger ingredients. Form into patties, depending on size of bun. 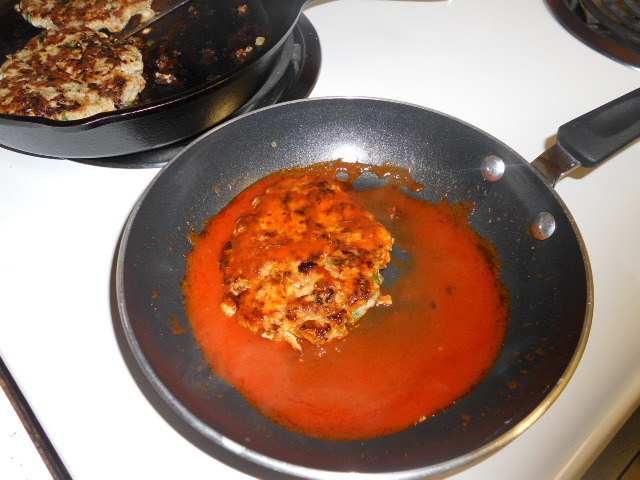 In a nonstick skillet over medium-high heat cook the burgers for about 6 minutes on each side, again depending size. Either transfer all burgers to a plate or in a separate pan prepare your buffalo dipping sauce. Melt butter on low and add the buffalo sauce. Dip patties in the sauce mixture until coated. Place burger on bottom bun and top with lettuce and blue cheese dip. Posted in Recipes, Sandwiches/Burgers and tagged Blue cheese, Buffalo burger, Cheese, COOK, Frank's RedHot, ground turkey, Hamburger, Lettuce, Rachel Ray, Ranch dressing. Bookmark the permalink. This recipe is very familiar to me, we ate it growing up for dinner in the summer time. Mr. Picky loves this salad, he often requests it. It is probably the easiest way to get him to eat his vegetables and go back for seconds and thirds. Okay so the vegetables are covered with mayonnaise, cheese, and bacon but who am I to judge. The best part of this salad is that it tastes best if made 4-24 hours ahead of time. Which makes it perfect for summer or to take along to a potluck. Make it the night before a busy day and come home to dinner done. I have seen the ingredients vary from recipe to recipe but this is how I make it. Wash, chop, and dry your lettuce. You want to have nice bite size pieces of lettuce. Whisk together mayo, sugar, pepper and powdered parmesan cheese. Set aside, this will be your dressing layer. In a large glass bowl you are going to layer your salad in the following order. A clear glass trifle bowl works great so you can see all the layers. I don’t have one but will be on the look out the perfect one to add to my collection of bowls. Helping hands making 7 layer salad. Layering: Lettuce, green pepper, onions, peas, mayo dressing, shredded cheese, and then bacon. Cover and refrigerate for 4 to 24 hours. The salad really needs to chill for at least 4 hours or it will not taste the same. When serving be sure to scoop all the way down through your layers. Even though we are a small family of four this salad lasts in our fridge for a few days just dishing it out as we want. After making this the other night for dinner Mr.Picky decided he wanted bowls of it packed for his dinners for the week. So away I went making generous Tupperware filled with 7 Layer Salad. No complaints from me, he is eating vegetables and I only had to make one thing for three dinners. Posted in Recipes, Salads/Dressings and tagged Bacon, Cheddar cheese, entree salad, layers, Lettuce, Mayonnaise, onions, peas, Picky, potluck, Salad, side dish, Vegetable. Bookmark the permalink. I love me a big salad, and I love a chopped dressed salad even better. I have made this chopped salad on various occasions. My inspiration is my favorite salad at a restaurant I love. We were headed to my sister-in-laws birthday and I was bringing a green salad. Tired of the normal green salad with different dressings, I made everyone step out of the box and brought this. It was a success. Mr.Picky even asked for me to make it again, and I saw many go up for seconds. We had grilled chicken so I just topped my salad and had that for dinner. Of course cut this recipe in half for a normal meal or dinner, but this is written to feed 10-12 people. *I have also added black beans and grilled chicken to this salad if we are eating as a main dish. Some crispy fried onions or crispy fried jalapenos are great on top as a garnish. Combine all the salad fixings in a large bowl. Whisk together dressing or put ingredients in a jar and shake, until smooth. Dress salad just before serving with dressing, add a bit at a time until the salad is coated evenly. Posted in Recipes, Salads/Dressings and tagged Barbecue, BBQ sauce, COOK, Lettuce, Olive, Ranch dressing, Salad. Bookmark the permalink.